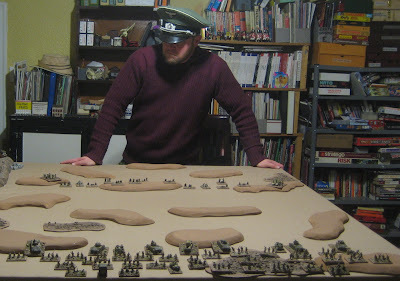 For this Thursday’s engagement I set up a little Blitzkreig Commander game nominally set during Operation Battleaxe. The scenario involved the Scots Coldstream Guard’s advance on 15 June 1941 supported by 7th Battalion Royal Tank Regiment. The 9th Australian division is cut off and besieged at Tobruk. Under pressure from Churchill to act Wavell launches Operation BATTLEAXE. A straight up Breakthrough attack right out of the book… well… with some random German reserves and a complete disregard for point values… So the British have 12 turns to exit 50% of their force off the far end of the table… It’ll be tough to do with infantry and Matildas! *dice at the beginning of each turn if the roll is LESS THAN the turn number minus 1 (i.e, need to roll 1 on turn 3, 2 or less on turn four, etc.) 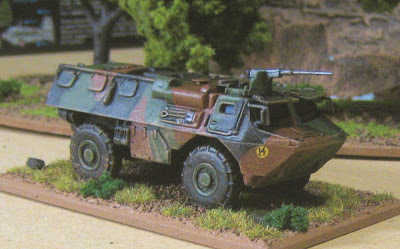 the German may attempt to bring these on as a flank deployment or mobile deployment from their own base edge. As it turned out no one else showed up this week…. On the plus side that means I got to wear BOTH hats! HUZZAH! 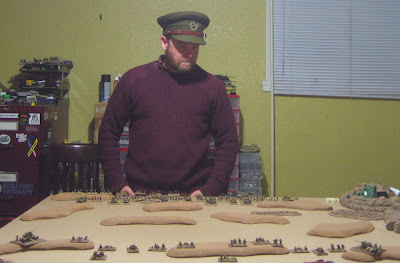 Oberst Braun inspects his defensive line. The Brits got off to a bit of a slow start. The Scotts Guards failed to move (evidently they though kick-off was at 5AM rather than 4:30… The Coldstream Guards surged forward twice. BLAM!! 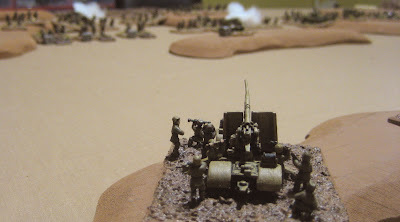 German 88s took out one platoon of Matildas! This time the Coldstreamers slowed down a bit, moving once, and the Scot Guards made up for their tardiness by racing forward three moves to catch up with the Coldstreamers on their left. Artillery was called in scoring a few hits but not a single suppression. German AT fire took out another platoon of Matildas, the Rolls Royce Armoured Car patrol, and the Scots Guards Carrier platoon. Lacking armoured targets in view the 88 on the left of German line started firing into the infantry. B Coy, Scots Guards – all suppressed! The German CO had a successful command roll, then a Command Bonus (rolled 2), and finished off the turn with a Command blunder (rolled 12) forcing him to re-locate! Both Guards Battalions did one move each during which both of the 88s tried out opportunity fire against them. Until this point the two squadrons were each under the command of the infantry battalions they were respectively supporting. On this turn I moved up the 7RTR HQ to take over direct control of the tanks – as I was having a hard time keeping them all within easy command distance of the infantry HQ. The Germans did very little this turn, other than suppressing two Matildas and failing their first reserve roll. The Guards infantry all surged forward, Coldstreamers twice, Scots three times. The tankers must have been confused about who they were to be taking orders from and failed to move anywhere. Then a British FAO successfully called in some artillery which scored THREE HITS on an 88!!! Pretty exciting! Then he saved one, wasn’t suppressed, and that was the round – so, essentially, no effect whatsoever! The Germans lit up some more Matildas this turn, after failing their second attempt at reserves. They also started causing hits and suppressions against British infantry. The total for the turn was 3 platoons knocked out (all coldstreamers) and 6 suppressions. Things started looking up for the Brits, briefly…. The Coldstreamers carrier patrol got in contact with the HQ boosting it’s command value to 9 for a turn – with this the Coldstreamers surged forward under supporting fire from the MGs and mortars, which were now in position. The third move brought three platoons into close assault! 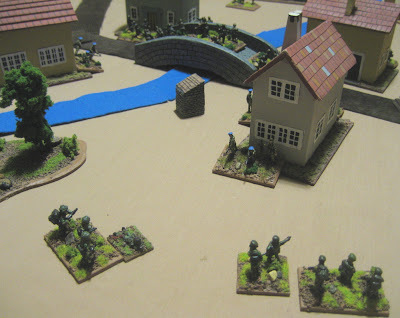 Of these messy melees the Brits lost one – it’s platoon being forced back, suppressed – but won two wiping out the German MG platoon and forcing another out of it’s entrenched position! The Germans, though they still didn’t’ get their reserve of tanks, also had a good turn. All those nice close infantrymen sitting out in the open… Two platoons were knocked out of action and 6 more suppressed – making it now impossible for the British to exploit the brief success they enjoyed earlier in the turn. The Coldstream Guards caused two hits with initiative fire… The HQ for 7RTR rolled it’s third 11 in a row for command rolls…. The Scotts Guards moved up into initiative range hoping to assault next turn – if they didn’t make it this turn. They didn’t. They wouldn’t. The CO sorted things out by tearing strips off of each and every one of the surviving officers in the RTR and got them moving for one round. The Germans didn’t need those tanks anyway… The tally for their turn – 10 infantry and two Matilda platoons knocked out of action, 7 suppressed! I called it a day at this point. Time to read through the rules again and try to find all the things I was missing. Another small addition to my Arsenal of Communist Aggression; the first (of SIX!) Ace BMP-1. …and there is it again. …and again… with some other stuff… I felt I had to take lots of picutes because it took so damn long to build… and I’ve got five more to do. 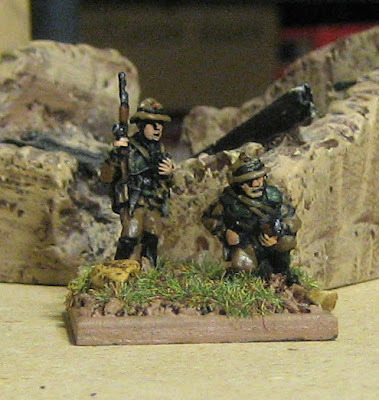 …again with some dismounted motor rifles infantrymen. This is a British AS-90 self-propelled gun. A little beyond my “mid-to-late eighties” plan as these, I don’t think, came online until the mid nineties. Ah well. It just sits on the edge of the table anyway to remind me that I do have off-table artillery assets… This one didn’t require much work. It was a pre=painted kit and it was actually nice enough that I decided to leave it and not repaint it (as I do with most “pre-painted” items). 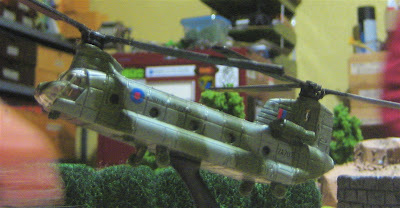 All I did was stick it on the base, add the base stuff and a little weathering (mud/dust) to the vehicle. A French VAB. I built this around the time I did the BRDM. It was a dream to assemble by comparison. I have four more – should be able to easily assemble them all in an evening. Maybe paint them in another or two…. Now if only I had enough infantry to deploy from them! I’ve also been working on my 15mm desert armour for WW2. This has mostly been sticking them on bases and repainting the numbers on the German panzers. 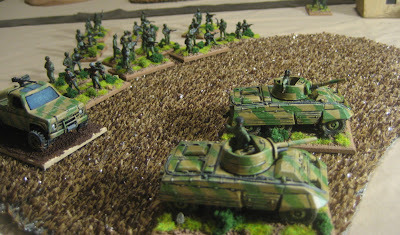 The numbers that had previously been on them were the three digit company-platoon-vehicle serials for a Flames of War(hammer) Panzer Company – as these will mostly be seeing action using Blitzkreig Commander for the foreseeable future, where vehicles/stands represent platoons, that whole number system just wouldn’t work so well. So I’ve been repainting them with single digits to represent which company they belong to. 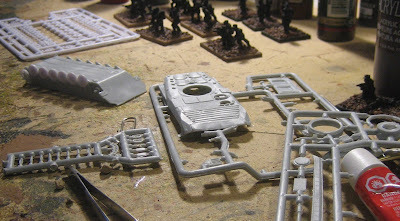 I also have a pile of more Panzer II and III I should paint up one of these days… When I get those done I’ll have the better part of an entire two battalion panzer regiment! Well… an under strength one at least… I’m not sure I’’m going to be getting to those right away though. 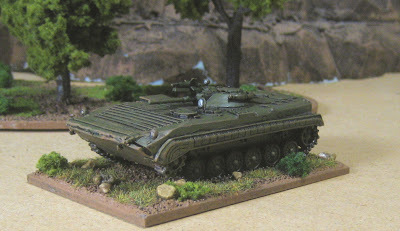 Next up I think I’d like to put the nose to the grindstone and finish up the BMP, the third company of Desantniki, or maybe start in on a third company of British and/or maybe some of the Challengers and Warriors that I’ve picked up for them… I should probably do the British infantry first as they could always be deployed as light infantry of one sort or another (paras… commandos… etc…). We shall see. I’m not going to set myself up any serious production schedules this winter. I think I’ll mix it up a bit to keep things “fresh”. 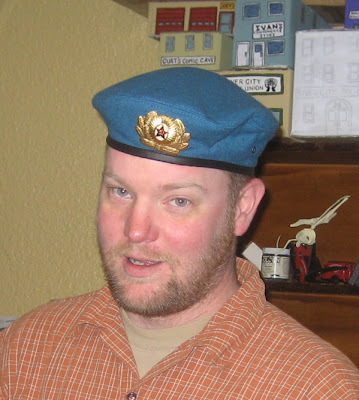 I had been planning on getting the tanks based and running a tank battle in the Western Desert last night but then my VDV beret I ordered off ebay showed up in the mail and I took it as a sign that Scotland was to be invaded by the Russians…. A company of Soviet VDV dropped during the night near Dunny, Scotland. Their mission was to secure the vital crossroads and bridge over the Black Dunny Water to prevent British ground forces to move forward and menace the Soviet amphibious assault on Northern Scotland later in the day. As dawn broke over Dunny, the desantniki found themselves positioned in the town with only about 20 men missing or injured. Just east of town, however, two platoons of Territorials were forming up to counter-attack the village, and Paras were on their way north by helicopter! 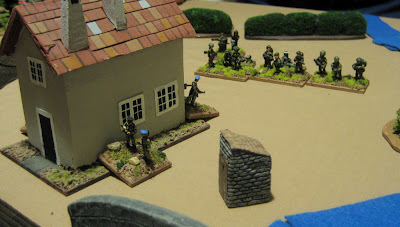 (These guys had no HQ – they would act only on the British players initiative phase. They would make one move toward the village each turn until they got within initiative distance of enemy troops then they could act as they wish taking one action per turn on the initiative phase. If there were British troops within initiative range each stand would have to dice before firing, on a 6 they would fire on the British by mistake). Dunny, Scotland. The Black Dunny Water can be seen winding its way through Glenn Dunny. You can see it but on top of the hill in the background are the ruins of Dunny Castle. 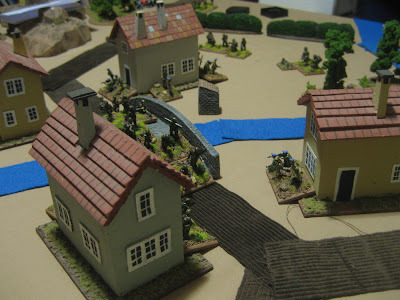 On the first turn Gary moved the TAs up to to take cover behind a hedge and started firing on the Russians in the building at the northeast corner of town. The exchanged fire for a few turns alternatively suppressing each other but generally causing no real harm. Gary had a turn or two where hw was unable to successfully issue any orders due to poor command rolls. 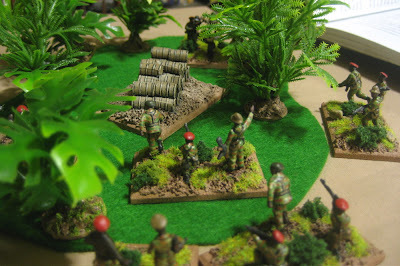 The SS re-enactors advance towards Dunny. Here are the Desantniki in the building at the northeast corner of town. Gary must have issued orders this turn because one stand is suppressed. On turn four the TAs finally got it together and took out a section of VDV with some accurately directed fire from their FNs. The next turn the sole Russian section in the building at the northwest corner of town vacated and moved over to the northeast building to help hold off the TAs. On turn five the Paras finally arrived. They moved onto the table… and stopped. Around the same time the SS re-enactors got into position and started firing on the Russians in the southeast corner of town. The Russians in the southwest corner of town watched for British heading their way. None came… at least not from the southeast. Same thing, different angle. This is about turn seven. 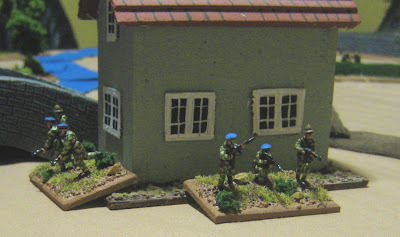 Russians in the southwest building redeploy to cover the fields to the west and northwest of town. The TAs shooting up the northeast corner of town. There is a gap in their line where I (finally) took one out. Realizing they had only a couple turns to complete their mission Britton decided it was “Go Time” on turn eight. Supporting this assault were the SF/GPMG and three of the sections armed with IATW rockets – they took out one of the VDV section in the building in the southwest on the first order and suppressed the second with small arms fire and another rocket on the second order. 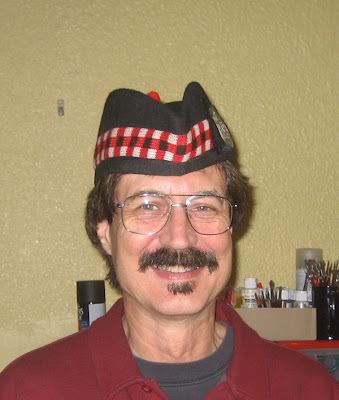 The Highland TAs also moved out on turn eight…. The remains of the Highland TAs; two (of the original six) Territorial Infantry sections. 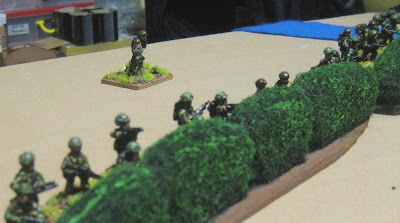 The SF/GPMG was also still in it’s original position behind the hedge. One last shot from the game end – taken from the north of town. Fun game – could have gone either way. I think I had just the right size of forces for a nice quick game. The guys showed up seven-ish and I was still getting ready, we probably got started between 7:30 and 8PM and finished up by 10PM… I was tempted to drop two whle companies on the village and have the British counter-attack with everything I have painted... but for once I showed a little resraint, and it was worth it. I definitely want to try out some armour in the near future. Next week, FOR SURE, I will play a little action in the Western Desert…! Hey if you made it this far - feel free to post a comment below and let me know what you think! 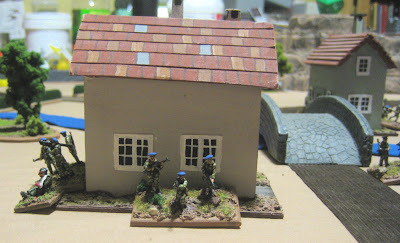 15mm Modern Stuff to Trade – Brits, Argentines, etc. I have a bunch of 15mm modern stuff I’d like to trade away. Most of it is MJ figures Falklands stuff plus a few Peter Pig AK-47 items. Most of them are unpainted and still in the packages. I have a larger selection of modern forces in 20mm and it’s just silly having stuff from the same period in two scales. So I’ve decided it’s time to get rid of ‘em and see if I can get anything useful in exchange. I don’t really want to SELL them as I know I won’t get anything for them – no one wants to pay anything near what they were originally worth – painted or not! 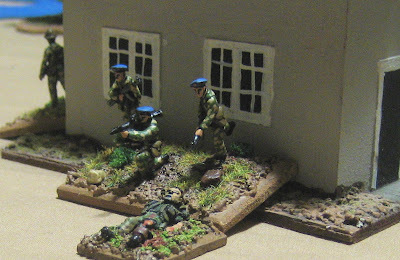 so 190 unpainted British infantrymen, total. 1x 17-42 Character pack of some sort. If you’re at all interested and got something good to trade post a comment with your email address – I won’t actually PUBLISH the comment…. It’s just a way of letting me know how to get in touch with you without having to publish my email address on this blog…. ….and here they are; the Motor Rifles. These are they only ones I have, so I’ll have to order some more form somewhere. Give the current exchange rate, now might not be such a bad time to do so. These are Combat Miniatures. I’m going to try and get the three that I have done this week. Hopefully the rest (I ordered two more) will show up this week and I can get all five done. I also did an HQ for the Motor Rifles. I guess maybe I should get working on the BMPs and some more Motor-Rifle Infantrymen, huh? Not that I HAVE many motor rifles infantry… I guess I could also do the third T-72 (I picked up a Revell kit – it actually looks like it might be about the same size!). (Reuters – Timpala) After nearly a year of shaky ceasefires and peace talks in the small central African country of Timbogo, full-scale fighting has broken out in again in the oil and diamond rich western province of Wuhu. Forces of the Federal Army of the Republic of Timbogo (F.A.R.T.) launched a major ground offensive against several strongholds of the Peoples Revolutionary Army of Timbogo (P.R.A.T.). The operations have had limited success so far. A spokesman for F.A.R.T. admitted that they may have underestimated the current strength of P.R.A.T. Local sources have also indicated the P.R.A.T. fighters have been fighting back tenaciously. It seems both sides only used this recent lull in the fighting caused by the ceasefires to re-arm, recruit and dig in for the next round. The future looks bleak for the impoverished African nation. I took a bit of a break from gaming for the last couple of weeks after Fallcon… Wanted to do a bit of painting and organizing… realized the organizing I wanted to do would probably take all winter rather than one month… and then got anxious about playing again and moving on with things. So during the summer I got excited about Blitzkrieg Commander and Cold War Commander. Then I had to just put them aside for a month or so and concentrate on forgetting about them and relearning rules I had already mentally cast aside so I could run it at Fallcon. Anyway I’m anxious to get moving on with some BKC/CWC action. Last night I decided to run a little AK-47 Republic scenario using the CWC rules. 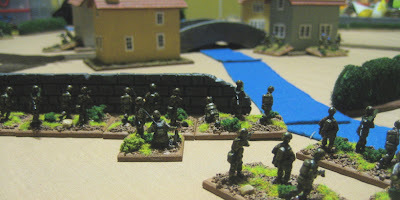 The scenario was set up just like a regular AK-47 game with both sides having five units – I ignored the political track, in fact I completely ignored points altogether – both the CWC and the AK-47 Republic point systems. I determined the attacker randomly and each side rolled randomly to see which units were available at the beginning of the game – objectives were determined and victory points would also be worked out according to the AK-47 Republic rules. There was one little hitch – one objective had to be the crossroads at the center of the table. At that crossroads was a unit of French Foreign Legionnaires. They had been deployed there to look after some French interests in Timbogo. At the village at the crossroads were some cute French humanitarian workers with some NGO or another (not to mention the French oil and diamond mines down the road, just off the table…). If fired upon or if any of the African forces came within 10cm of them they would just start shooting and thereafter shoot at the closest Africans on the initiative phase of one players turn or another – to be determined at the time they were activated. What I should have done is have them activate if any firing took place within their initiative range – whether it was targeted at them or not! 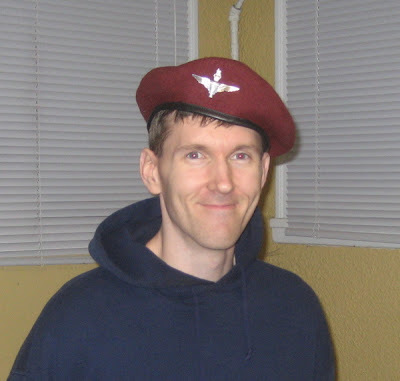 Gary played the forces of P.R.A.T. who were defending. I played the F.A.R.T. troops, which were attacking into the P.R.A.T. held regions of southwest Timbogo. Gary got three of his five units and deployed one on each of the objectives and kept the third in some trees in a sort of reserve. I got four of the five units to start and deployed them at my table edge. 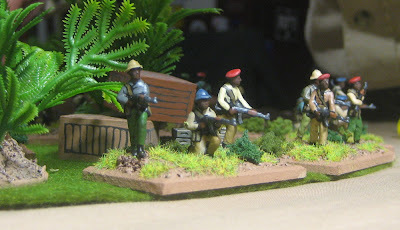 The “Lions of Timshasa” F.A.R.T.’s elite special forces commando unit was engaged right off the bat! They tore into the P.R.A.T. unit defending the objective area closest to my table edge. These guys would be “professionals” in AK-47 republic, in CWC I gave them 4/30 attacks and no CV modifier to enter Close Assault and +1 attack in Close Assault. The rest of the F.A.R.T. 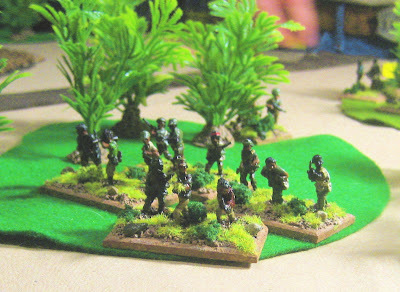 regulars start making their way to the other objective at the far edge of the table. Both sides (wisely) gave the French a wide berth. These are some of the P.R.A.T. troops holding the far objective – they never fired a shot in anger the whole game – at least not at the enemy. My guys again on the “advance”. The technicals and Greyounds proved to be quite useless – in the face of RPG-wielding African warriors… The Mercedes is my CO, gotta ride in style! The Lions of Timshasa about to finish off the last of the P.R.A.T. forces holding Objective #1 unfortunately it was only a 20 point objective. After we finished nattering and getting caught up I imagine the game actually took about two and a half hours. At the end we totaled up the points. For a grand total of: 44 victory points! Huzzah! Enemy units (formations) destroyed (one – my technicals!) +20!? For a grand total of: 51 victory points! According to the rules a difference of 7 indicates “a clear victory, well at least in the view of the victor”. That seems reasonable. If it had lasted another round I’m sure Gary would have swarmed the remaining Greyhound with infantry in a close assault and destroyed it that would have given him another 20 victory points! Luckily the game ended and the forces of F.A.R.T. called it a day and headed back to Timpala having to be satisfied with having destroyed/captured one of P.R.A.T.’s caches, as well as destroying a unit…. Good fun! There was a lot of tension in the game and it really looked like it could have gone either way a number of times early on – especially in the first fight between the Lions and the P.R.A.T. 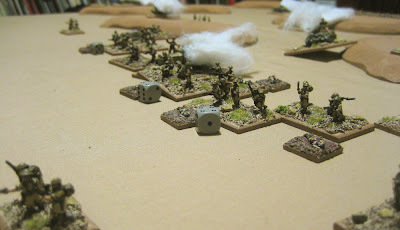 troops holding the first objective – the first turn it looked like I was just going to roll over them. The second or third turn, however, one of the P.R.A.T. units won a close assault destroying one of the Lions and forcing two others to retreat! GAH! 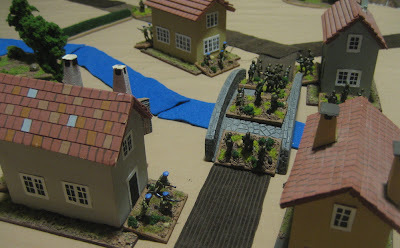 The other main fight went back and forth a bit – two forces blazing away at each other from cover – taking turns suppressing each other but not causing any real harm… Then I started failing command rolls and Gary had a couple of strings of successful rolls, which kind of turned the tide. For the last couple turns the writing was really on the wall and I was just dragging out the inevitable trying to at least hang on to the units I had and not lose anymore. I had one run of successful command rolls, unfortunately it was in maybe the second last turn and it was with the single Greyhound (2/50 attacks) even with bonus dice for being under half and being an AFV vs. unarmoured within 20cm I just couldn’t cause any real damage!? After about six or seven shots in a row I think I only managed to take out one MG stand and maybe cause a hit or two but no suppression on another…? Maybe Gary will remember. It was sad. Sad, but fun just the same. Thanks Gary! Next week Britton has expressed an interest in some WW2 tank action in the desert! Perhaps we will see the 150th Brigade try and defend the Cauldron at Gazala! If you got this far why not post a comment below and let me know what you think?! Whoops!? 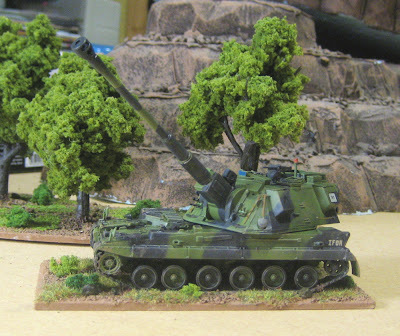 More Modern 20mm Americans….! 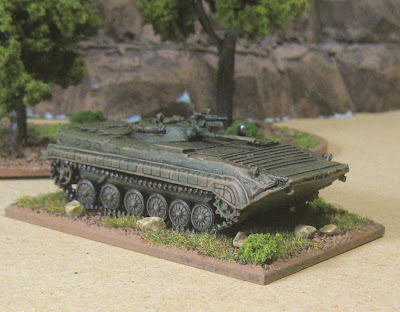 Modern 20mm – Part Three: Vietnam!